Macey (left) and Harley’s owner called me to help them get their dogs to listen better, put an end to their pulling on the leash and stop them from getting over excited when they see new people or animals. As soon as I met them in person I could see why their owners called me for help. These are two very powerful and determined dogs with an abundance of energy. I didn’t sense any aggression or attempts at dominance, just an abundance of energy and lack of self control. Harley showed classic signs of insecurity like barking then moving away, standing under furniture or tables, and overall skittishness. I ignored him at first to let him get to know me in his own time. As the session progresses, he came closer and got more comfortable, but still showed signs of anxiety. Macey didn’t show much respect for people’s personal space, responded to commands or corrections intermittently and was very determined when she made up her mind about something. After discussing the situation with their owners, I demonstrated a leadership exercise that will also introduce the concept of self restraint. Because of Harley’s insecurity, I practiced the exercise with Macey. The exercise involves placing a high value item on the floor and communicating the dog that it cannot have it without permission. Once a dog lies down to signal it is no longer challenging for the item, I give the dog permission to get it. Normally a dog will try to circle around or bull their way through the human to get the treat the first time they do the exercise. Macey tried to push her way to the treat once, then flopped down on the ground. As soon as she did, I turned to my side, kneeled down and tapped near the item to communicate she had permission to get it. I practiced the exercise with her a few times before coaching her owners through it as well. By the time we finished, Macey was laying down almost immediately so I offered her owners a few tips on how make the exercise more challenging. I advised her owners to practice this exercise with both dogs daily for the next week or two. The repetitions and increasing the level of difficulty will help the dogs to start to stop and look to their owners when in need of guidance. Next we prepared to go out for a short walk. I fitted both dogs up with Martingale collars and added my special twist to the leash before going over how to hold the leash, correct the dog and offer praise when it was in the correct position. I started out with Harley alone and man is he one strong dog. The Martingale collar was helping, but Harley still needed a number of corrections to keep him in a heel. His owners told me that they had stopped walking the dogs due to the pulling and you could tell they were out of practice. After getting Harley to stop pulling, I went over and grabbed Macey’s leash to see what it was like to walk both dogs. Now I’m an experienced dog walker, so when it takes a bit for me to get the dogs to walk at a heel, but these two were a real challenge. It took a few minutes to get them to stop pulling as much, but they were far from perfect. I handed the leashes over to their owners and coached them through the proper position, hand movements and corrections. Because of how strong these dogs are, combined with a lack of regular walks, I suggested that they start going for short structured walks daily. I went over the rules for a structured walk; no sniffing, no urinating and that the dog must stay in his or her position next to the human. I advised them to stop and put the dog into a “sit” every 3-5 paces. It took several corrections and encouragement to get them to sit which was to be expected for dogs that hadn’t had much recent practice at the walk. As soon as either dog sat down, I made sure their owner provided them with a reward or praise while repeating the command word. This positive reinforcement has a gradual or cumulative effect when rewards or praise is offered as much as any corrections. By keeping the dog in a heel and asking it to stop and sit every few paces, their owners will be able to condition the dogs to pay attention to them and walk calmly with a loose leash. After we finished the walk, I showed their owners a more structured way to feed the dogs. As shown in the photo, I had their owners communicate to the dogs that they were not allowed in the kitchen until they had permission. Once they started to respect that boundary, I had their owners eat a few chips in front of them while the dogs waited. Eating before you feed your dog can have a big impact on its perception of authority amongst the members of the home. 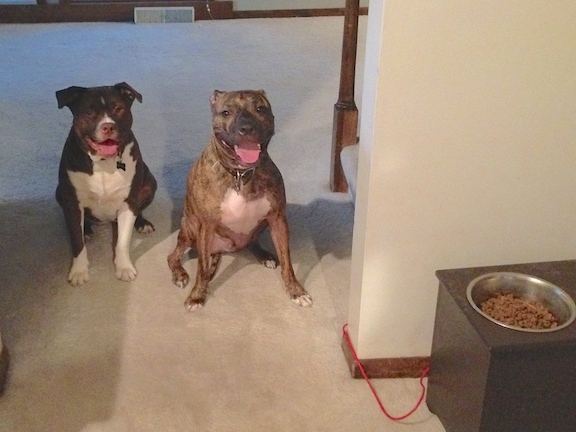 By making the dogs wait for permission to eat, they will see themselves as being in a follower position. This combined with structured walks and practice at the leadership exercise will help condition the dogs to defer to their humans. Once this becomes habit, it will be easy for their owners to disagree with any behavior they disagree with.